Home » aaron allston , books , high point , michael stackpole , science fiction , star wars , stellarcon , steven glaspie , timothy zahn » It's Steven Glaspie and three bestselling Star Wars authors! 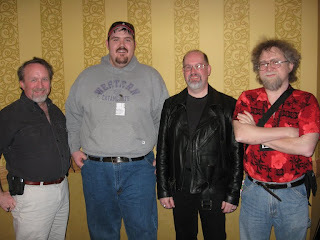 It's Steven Glaspie and three bestselling Star Wars authors! Allston, Stackpole and Zahn did a panel discussion for an hour and a half this morning that we got to attend, and Steven and I both came away very thankful and appreciative of what these three writers shared with everyone. Used to go to Stellarcon years ago, back when it was on the UNCG campus. Got to meet Theodore Sturgeon and his wife, and David Gerrold there. Nice to see it's still going on. "I still don't get why you would pay $20 for a convention and still for just a few hours. :/"